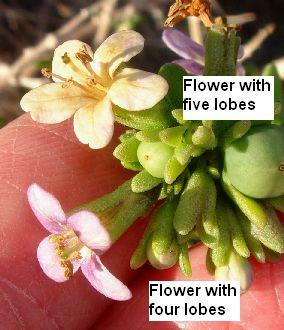 The key to determine specimens uses both flowers and fruit, and often all one has are flowers. One major couplet in the 1932 Hitchcock key used in Munz and the Jepson Manual, using the ratio of the calyx lobes to the calyx tube and the calyx lobe length, is often indeterminate, with some specimens satisfying both branches. 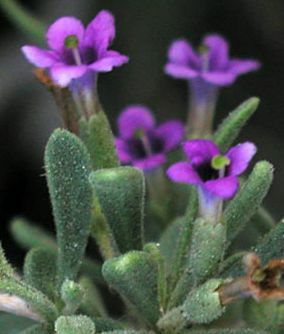 The key uses the hairiness of the calyx and leaves, and some specimens do not appear to have read the key and might be easily keyed under the "wrong" hairiness. 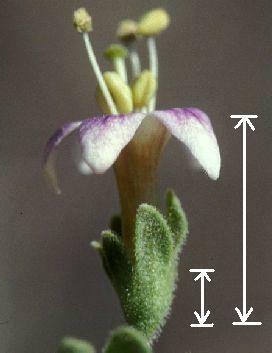 The measurements given in the floras of the leaf lengths and widths, and the calyx tube and lobes, often do not give the full range for all species. 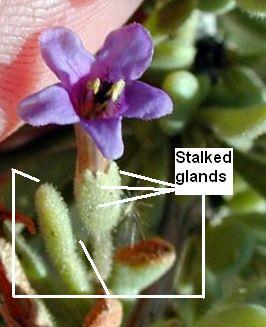 The flowers quickly fade and shrink in voucher specimens, making it difficult to determine colors and corolla lobe lengths. Fortunately, we have just five Lycium species (see note below) in the desert portion of San Diego County (according to the Checklist of the Vascular Plants of San Diego County, Jon P. Rebman and Michaal G. Simpson, 4th edition, 2006), and they each seem to have one or more unique characteristics that immediately determine them, except for two species that require the combination of two characteristics to distinguish them. The following table gives the unique characteristics, along with a picture showing those characteristics. Most of the botanical terms are illustrated in the picture, and all are explicitly defined below the table. The non-plant parts in some of the pictures are human fingers. 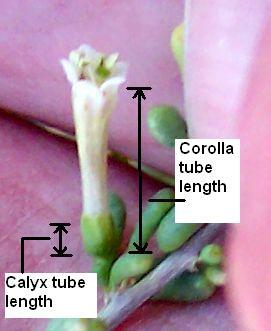 L. andersonii Corolla tube = (4-7) x calyx tube and calyx glabrous (without hairs). All other species except L. fremontii and L. parishii have a ratio of less than 4. Those two species have ratios of 2-5, but they have glandular-pubescent calyces. In the picture on the immediate right, on my screen, I measure the corolla tube as 42 mm and the calyx tube as 8 mm, for a ratio of 5.2. You should get the same ratio, even if your screen size is different. L. brevipes var. brevipes Corolla lobes = (0.33 - 1) x corolla tube; the other species usually have a ratio of 0.15-0.33. # of calyx lobes and corolla lobes 4-5; the other species seem to almost always have 5 calyx and corolla lobes (However, I've now observed that L. fremontii also sometimes has 4 lobes, so this may not be a good discriminant). In the picture on the immediate right, I measure the corolla lobes to be 20 mm and the corolla tube to be 40 mm, for a ratio of 0.50. L. fremontii Plant densely glandular pubescent AND calyx lobes short, not appearing leaf-like. The other species are without hairs, to moderately hairy, usually without glands, except for L. parishii. L. parishii has leafy calyx lobes that are approximately as long as the calyx tube. The dense stalked glands are visible as the "little balls of goo" on tiny stalks, and often glistening in the light. The white lines point to only a small number of the glands. The glands are sticky, and often have attached objects, such as the dandelion fluff in this picture. In the other picture, the glands are visible mostly as white dots. 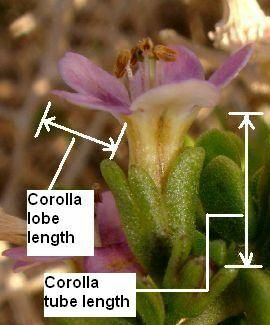 The ratio of the corolla tube to the calyx tube is 1.9-2.4 in the pictures, but I have observed flowers with a ratio of 5.4 in Fossil Canyon in Imperial County. L. parishii Plant slightly- to densely-glandular pubescent AND calyx lobes leafy, about as long as the calyx tube. The other species are without hairs, to moderately hairy, usually without glands, except for L. fremontii. L. fremontii has short calyx lobes that do not appear leaf-like. The ratio of the corolla tube to the calyx tube is 2.9-3.5 in the pictures here; this picture has a ratio of 4.4 and shows the glands more clearly. The corolla is what most people refer to as the flower, the showy white to purple part. The corolla consists of a tubular lower portion, the corolla tube and the 4-5 lobes at the tip. 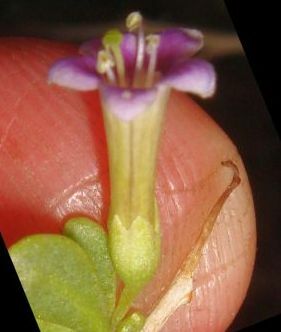 Botanists consider the lobes to be the free (not connected) portion of the petals, which are fused into the tube below the lobes. The calyx consists of the green bracts at the base of the corolla, surrounding it there. It also consists of a tube and lobes. The fruit is like a little tomato, a berry that is either green or red. Pubescent refers to hairs that can only be seen by a magnifying glass, although often when botanists refer to a plant having hairs it can mean either hairs visible to the eye or smaller ones. Glands are hairs with balls of goo at their tips. 1. 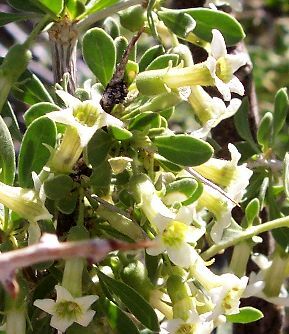 Flower greenish-white ... Lycium cooperi, Cooper's desert thorn. 2. Plant glabrous, with long exposed corolla tube ... Lycium andersonii, Anderson's desert thorn. 4. Calyx lobes glandular; sandy to rocky slopes, canyons ... Lycium parishii, Parish's desert thorn. 4'. Calyx lobes not glandular, a bit spreading; flowers relatively big; low elevations ... Lycium brevipes brevipes, Common desert thorn. Project Lycieae by J.S. Miller and R.A. Levin for a key to the North American Lycium species and pages devoted to each species. The pages for our five species are: L. andersonii, L. brevipes, L. cooperi, L. fremontii, and L. parishii. Lycium by Richard W. Spjut. 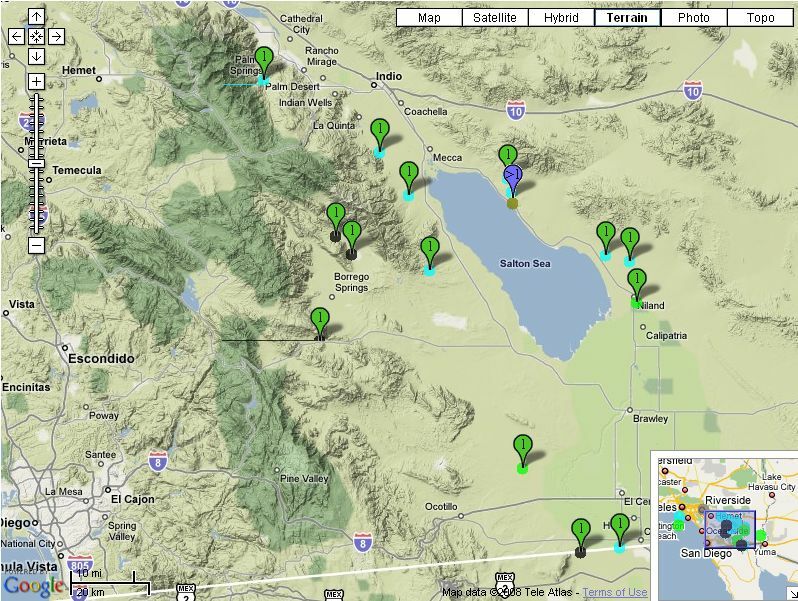 There are four online vouchers of L. torreyi in the San Diego County desert, but it is not accepted as being in the County by Rebman and Simpson. L. torreyi is very similar to L. andersonii, and those vouchers may be misdetermined L. andersonii. L. torreyi is supposed to have woolly-ciliate corolla lobe margins, whereas L. andersonii has glabrous to finely straight-ciliate margins. There is also a large difference in the ratio of the corolla lobes to corolla tube. On 4/6/11 I measured the ratio of a number of flowers from plants in the Indian Canyons west of Palm Springs. All were consistent only with L. andersonii, despite some having ciliate corolla lobe margins. There is also supposed to be a difference in the ratio of the calyx lobes to calyx tube, but this measurement is fraught with peril because exactly what is lobe and what is tube depends on the orientation of the calyx. In many Lycium flowers, there is one deep division in most calyces, with all other divisions shorter, so you'd get very different values for the lobes and tube if that deep division was used. 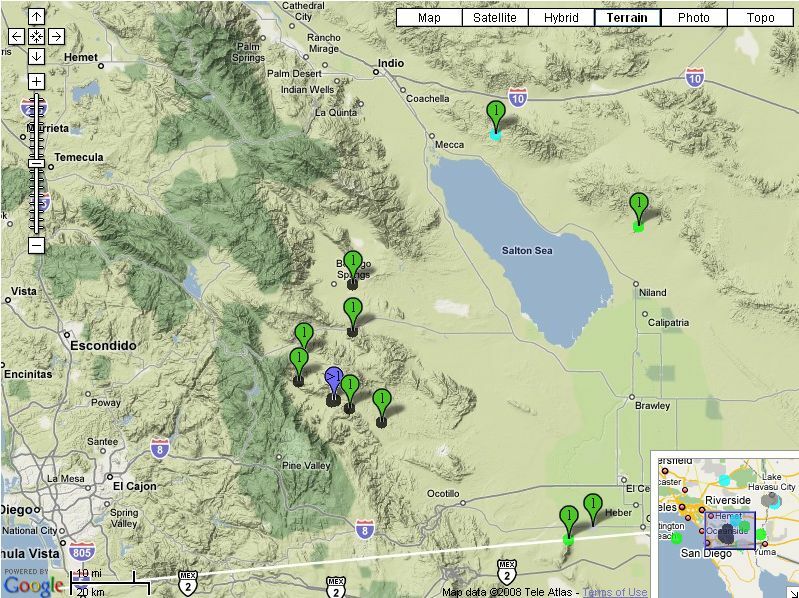 Among the North American species, it would appear that L. Andersoni and L. Torreyi may occasionally hybridize where the ranges of the two species overlap-in the Coachella Valley of southern California and in Arizona and southern Utah. Through-out its range L. Torreyi has white-fringed corolla-lobes, and a more thick, but proportionately shorter, corolla-tube than L. Andersonii, the latter species having but sparsely ciliate corolla-lobes. 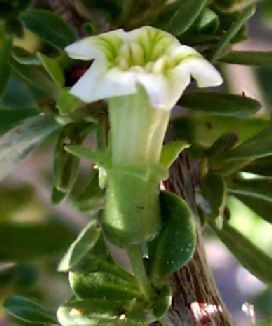 However, where the two species occur together, forms have been collected having the slender corolla-tube and leaves of L. Andersonii but with the lobes of the corolla being lanate as in L. Torreyi, the habit of the plant being more like that of L. Torreyi. Similarly, at least one instance has been noted where L. Richii [TJC: =L. 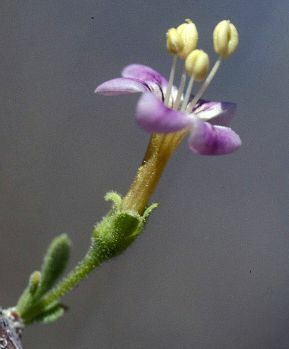 brevipes] has apparently hybridized with L. Torreyi; this plant was collected in the Coachella Valley, the only region where the two species overlap in range. It may be that Hitchcock's "L. torreyi" from the Coachella Valley may be due to a looser interpretation of how woolly-ciliate the corolla lobe margins need to be to qualify a specimen as L. torreyi. It would be good to re-examine those vouchers using the current determination of woolly vs. straight-ciliate. Many "hybrids" of the past have gone away once the full range of variation within a species has been recognized. Need to update page to discuss heterostyly, and thus how one can be confused about the "corolla lobes 1/3 tube" depending on what type of flower is present. is called "heterostyly", and has evolved to prevent self-pollination. - flowers with long stamens and short pistils are called "thrum" flowers. the styles in "pin" flowers are shaped like "pins", hence the name. i couldn't find the origin of the name "thrum". pin and thrum flowers on different individuals in L. exsertum and L.
fremontii; Miller & Venable 2000)"